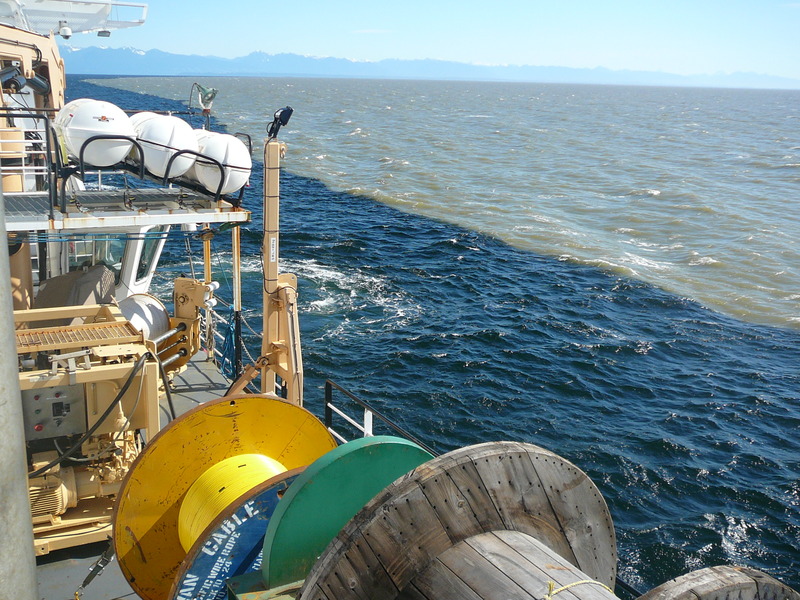 Oceanographers have been studying the Fraser River plume since at least the 1960s, but more recently, Ocean Networks Canada has installed a radar system to measure the surface currents in this region. Furthermore, Ocean Networks Canada has also installed the Seakeeper seawater monitoring system on the BC Ferries MV Queen of Alberni to collect detailed information of water properties along the Duke Point – Tsawwassen ferry route which cuts through the plume eight times per day. These new observations, coupled with satellite imagery, are being used by UBC researchers Dr. Mark Halverson and Prof. Rich Pawlowicz to reveal the nature of the Fraser plume. The research is being carried out as part of the Marine Environmental Observation Prediction and Response Network (MEOPAR), which is tasked with improving Canada’s ability to respond to marine hazards. In the early summer when the Fraser River carries high sediment loads, the plume is easy to distinguish from ocean water by its distinct light brown colour (above). It can be highly reflective and opaque to sunlight, and because it is a mixture of river and ocean water, it can be quite “fresh.” A comparison of the measured surface currents to both surface water salinity and satellite imagery shows that a jet of swiftly flowing water can form near low tide (below). A sharp change in the currents occurs where the ocean colour and salinity change rapidly, signifying the edge of the plume. As the plume waters move away from the river mouth, it appears that the wind ultimately determines its fate. During northwesterly winds, the plume is driven to the south, while during southeasterly winds, it is driven to the northwest (below). However, the relative importance of the wind might change when the river flow is much higher. Ultimately, researchers hope that a better understanding of the surface currents in this area will be useful to emergency response operations by providing a way to anticipate the trajectory of, for example, spilled oil or other contaminants.